The basis of many Thai dishes, especially curries, is a highly flavoured paste. These pastes are made by grinding the ingredients together, usually in a mortar and pestle, although inferior results can be achieved in a blender. The pastes are usually named for their colour, eg green or red curry paste, or for the dish they form the basis of, eg Mussaman paste. They invariably contain a balance of the four taste elements of Thai cuisine: sweet, spicy, salty, sour. 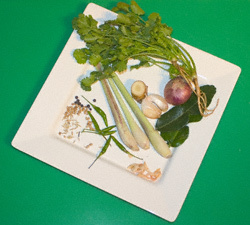 There are as many different recipes for Thai green curry paste as there are people who make it. There are no hard and fast rules – just a few basic principles and common ingredients. The picture above shows some commonly used ingredients, which were then ground to a paste with a little vegetable oil. They include coriander, chillies, shallots, galangal, lemon grass, kaffir lime leaves, coriander seeds, black peppercorns, cumin seeds and dried shrimps. The curry itself is likely to contain other flavourings such as nam pla (fish sauce), palm sugar and lime juice to get the balance of flavours right. Commercial pastes are widely available and these days many supermarkets also stock jars of Thai curry sauces. But home-made is almost always best.